If you look at the final table from the MTN Elite Two 2010-2011, you will see that CNIC-UIC de Douala won promotion to the MTN Elite One. I am not sure what has happened, but the club has apparently changed name to New Star de Douala and will compete under this name. I have been wondering whether New Star de Douala is a completely new club as only a couple of players from CNIC-UIC de Douala have been retained. One of the retained players, striker Hermann Landry Tonye Hagbe has already scored four league goals for the newcomer, including a hat-trick. Tonye Hagbe played for Union Douala during the MTN Elite One 2008-2009. Interestingly, several of the new players are former players of Astres Douala, including Paul Roland Bebey Kingué (born 09.11.1986), Jean Claude Bessong a Riwou (born 01.01.1983), Tobie Julien Ebah, Jean Marc Epée Diboundje (born 25.07.1989), Thierry Medjo Ntye (born 14.03.1989) and Roméo Yem Yem (born 13.06.1990). The versatile attacker Yem Yem has perhaps been the most impressive, equally comfortable on both wings. Other new players include central defender Hervé Guillaume Boumsong (born 13.12.1988), formerly of Canon Yaoundé, midfielder Thierry Makon Nloga (born 09.10.1983), formerly of Caiman Club, goalkeeper Janvier Mbarga (born 27.09.1985), formerly of Union Douala, midfielder Eboa Mbock Mbonjo, formerly of Union Douala and left-winger Arnauld Ngouyap (born 25.12.1986), formerly of Fovu Club. Makon Nloga has been particulary impressive, scoring goals in his last three matches. Most players mentioned are experienced performers but perhaps not too exciting from a talent scout’s point of view. Personally, I am more interested in versatile defender Idriss Nguessi (born 02.05.1992) who played for the Cameroon U-20 national football team during the FIFA U-20 World Cup in 2011. It’s not often you see a side being built on so many new players. So far, New Stars de Douala has scored a lot of goals (10) and conceded almost as many (9) and I guess it will take time before they are a consistent performer in the league. The newly promoted side has done well in their debut season at top level. Striker Frankline Metuge (born 17.06.1988) has showed impressive form and scored the first ever top level goal of Njalla Quan. Their new goalkeeper Sadjo Sodea (born 01.01.1983), signed from Scorpion FC, looks solid. Other key players include defender Ransom Etengeneg Akangmba (born 11.03.1990) and midfielder Stanley Ekema (born 11.08.1987). Impressive goalkeeper Alain Tekeu Tchoumte and left-winger Ngampiep Vigny Kologni (born 27.11.1983) are perhaps the biggest stars of Panthère Sportive. Two new signings from Unisport FC also looks promising, namely winger Joseph Kajo Kameni (born 21.10.1988) and midfielder Hamgue Armand Tchangue (born 28.11.1987). Renaissance has yet to score a single goal this season. Teenage striker Patrick Anaba Metogo or the newly signed striker Christian Fack Bayokolack, formerly of Canon Yaoundé, should be able to score some goals this season, but my guess for top scorer is playmaker Alix Bertin Ondobo Ebanga (born 26.01.1990). Renaissance has two interesting goalkeepers in Eric Ngana (born 03.10.1992) and Ferdinand Ngarwa (born 27.06.1991). The defensive pair of Ibrahim Walidjo and Robert Ntolla Nguena (born 16.04.1985) also looks strong. Ntolla Nguena captained Canon Yaoundé last season and this is truly a great signing for the modest club, well-known for developing talented players. Sable FC has two solid goalkeepers in Franck Olivier Zibi and Thierry Tangouatio (born 04.05.1992). The defence is marshaled by Basile Baba (born 10.09.1984) while Harry Ako is the main man in midfield. Striker Daouda Souaibou (born 20.03.1984) scored regularly for Ngaoundéré University FC last season and he will most likely become an important player at Sable FC. 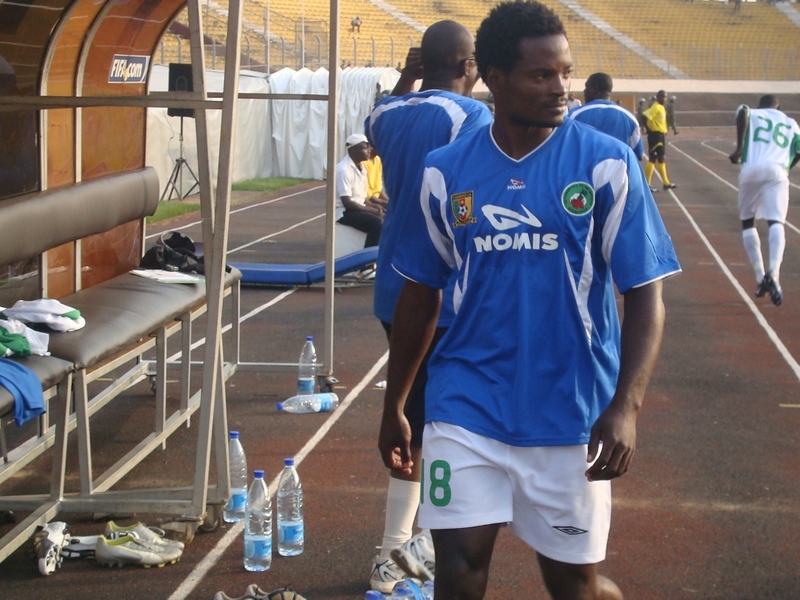 Striker Franck Hemmo Simo was mostly a substitute last season, but scored two goals against New Stars FC in Round 4. Unfortunately, I have not been able to find one Scorpion FC line-up during their first four matches. However, I know that the club has lost three of their best players: goalkeeper Sadjo Sodea to Njalla Quan, attacking midfielder Augustin Dourwe Taoga to Astres Douala and top scorer Patrick Naï to YOSA. Tiko United FC has made a big name signing in experienced centre-forward Robert Jama Mba (born 23.03.1980), a former member of the the Indomitable Lions. Jama Mba was last seen in Tanzania, playing for Young Africans. Defensive midfielder Mario Williams Elimbi is a player to watch. Perhaps Union Douala could be challenging Cotonsport FC this season? They have definitely made some smart moves on the transfer marked before the season. Mfombam Mounchili is the new first choice goalkeeper, signed from APEJES FC de Mfou. Mounchili was training with the Cameroon U-23 national football team last year. Jacques Bertin Nguemaleu (born 02.09.1989) is still leading the defence together with Souleymanou Mandjombe (born 03.05.1987), signed from Tiko United FC. Ludovick Yvon Mintya Angoh (born 12.08.1986) is a creative force in the middle of the park and new signing Joël Moise Babanda (born 12.01.1984) has already scored three goals since joining from Cotonsport FC. The picture is of Babanda and is taken from Lechabba. Arnaud Monkam Nguekam (born 22.02.1986), also signed from Cotonsport FC, has not been able to cement his place in the team despite his obvious talent. Clevis Tambe Ashu (born 01.01.1985), the third newcomer from Cotonsport FC, is a brilliant winger, providing crosses for top striker Charles Edoa Nga (born 17.05.1990). Serge Ane, who was part of the Cameroon U-17 national football team last year, joined Union from the Friendship Academy in Douala and has already forced his way into the team despite his young age. Ane started the first three matches of the season. Unisport FC could also be a candidate for silverware this season. The majestetic Kerrido Haschou has taken over the gloves after Collins Maifanya. Charles Lobe Lembe (born 15.07.1987) and Thierry Tonye Biheng (born 24.10.1987) are still two of the best defenders in the league. Marcellin Ngando Mbiala (born 27.02.1989) is a free-scoring midfielderand Gérard Bakinde Bilong is an interesting newcomer from Union Douala. Alex Ngamou (born 15.01.1990), a striker or winger, has been impressive, scoring in each of the three first matches of the season. Valentin Bertrand Biloa (born 12.06.1988) should also chip in with a couple of goals. The Young Sports Academy has gotten back their perhaps all-time best player, brilliant striker Jude Vernyuy Kongnyuy (born 05.05.1989). Kongnyuy scored in the two first rounds of football and has apparently returned a better player after a stint in Syria and Al-Ittihad. Patrick Naï (born 27.01.1992), the new signing from Scorpion FC, Tagne Fotso and Christian Deugoue are all quality strikers so YOSA should be able to score goals this year. Please note that this article was written on 18.02.2012. MTN elite one not doing bad for a start but we shall be glad if we could have the highest goal scorers after every day being published.